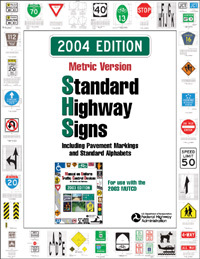 The Standard Highway Signs Book is designed to be navigable from the Table of Contents. Opening the Table, and clicking on any sign listed therein, will open the appropriate document and page for viewing. The MUTCD team is currently rebuilding the individual pages into chapters, to facilitate downloading and saving. When the chapters have been assembled, they will be made available on this page.